Aim and Objective: In this work, water was used as solvent for the eco-friendly synthesis of imines under microwave irradiation. In the first step of the study, 5-pyridinyl-3-amino-1,2,4-triazole hydrochlorides were synthesized in the reaction of amino guanidine hydrochloride with different pyridine carboxylic acids under acid catalysis. A green method for 5-pyridinyl-3-amino-1,2,4-triazoles was developed with the assistance of microwave synthesis. 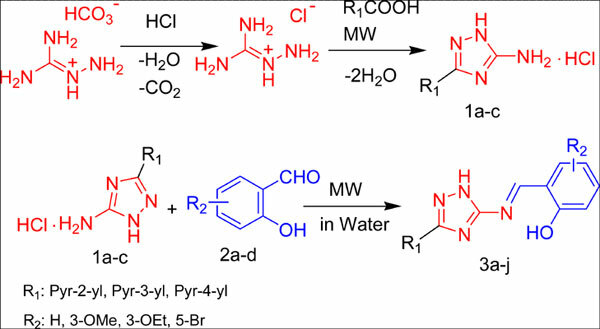 In the second step, the eco-friendly synthesis of imines was achieved by reacting 5- pyridinyl-2H-1,2,4-triazol-3-amine hydrochlorides with salicylic aldehyde derivatives to produce 2-(5- pyridinyl-2H-1,2,4-triazol-3-ylimino)methyl)phenol imines. Materials and Methods: Microwave experiments were done using a monomode Anton Paar Monowave 300 microwave reactor (2.45 GHz). Reaction temperatures were monitored by an IR sensor. Microwave experiments were carried out in sealed microwave process vials G10 with maximum reaction volume of 10 mL. Results: When alternative methods were used, it was impossible to obtain good yields from ethanol. Nevertheless, the use of water was successful for this reaction. After 1-h microwave irritation, a yellow solid was obtained in 82% yield. Conclusion: In this work an eco-friendly protocol for the synthesis of Schiff bases from 5-(pyridin-2-, 3- or 4- yl)-3-amino-1,2,4-triazoles and substituted salicylic aldehydes in water under microwave irradiation was developed. Under the found conditions the high yields for the products were achieved at short reaction time and with an easy isolation procedure. Green synthesis, microwave irradiation, 1, 2, 4-triazole, salicylic aldehyde, schiff base, pyridinyl.